Corbett House is ideally situated for those wanting to make use of the various cycle trails in the area. After hitting the trails why not soak those tired muscles in our cedar hot tub, while enjoying our wonderful accommodation. We have a number of trail bikes available as well as a large bike stand for our guests to use. 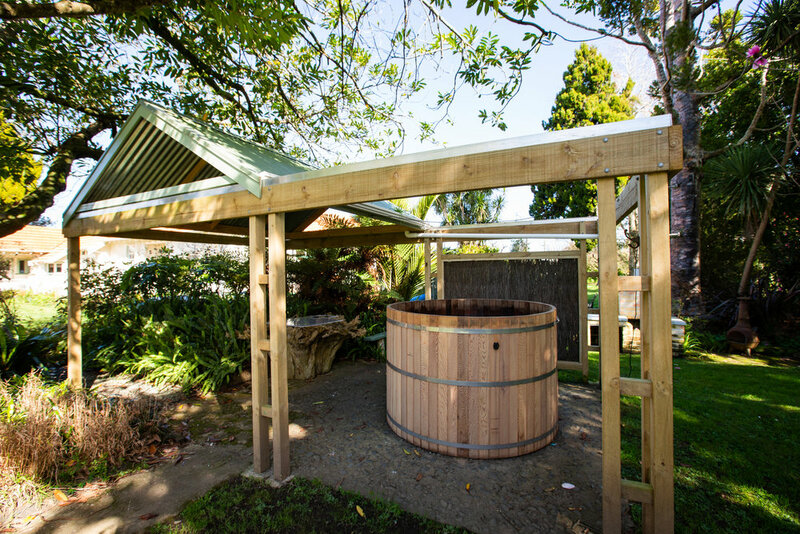 Our cedar hot tub is situated in the fernery in the private back section of the property. It features a sliding roof which is manually operated, so no matter what the weather you can still enjoy a soak. It's also the perfect spot for relaxing and night time star gazing. Our swimming pool is a great way to cool down after a full day on the cycle trails and perfect for those hot summer days. The back verandah has early morning sun where you can enjoy your breakfast and just relax and enjoy the peaceful surroundings of Corbett House. Why not enjoy a game of billiards on our full size 12ft table. This beautiful original table is available for guest use free of charge. The guest lounge is the prefect place to relax and unwind in the heart of Corbett House. Situated off the billiards room it has a flat screen TV with SkyTV including Sky Sports. It also has an extensive reading library as well as many magazines. Why not enjoy a game of tennis when you stay at Corbett House. Alley Memorial Park, which has a Tennis and a Bowling club is just a five minute walk down the road. Tennis rackets and balls are available for our guests at no extra charge.